I am getting null pointer exception when I get a process instance variable in drl file. 12:48:23,829 ERROR [STDERR] Exception in thread "Thread-20"
rule "Get Information To Start Procedure"
Whe in do Persona persona = (Persona)$processInstance.getVariable("personaVar"); persona is null. I would like to know what I am missing?? In "Solicitud Empleado", are you giving any value to "persona"? You have configured the output of that Human Task to return a "persona" and to set the value of "personaVal" with its value. So, if you are not providing any "persona" when you are completing the task, "null" is going to be assigned to that variable. Where should i set persona values?? 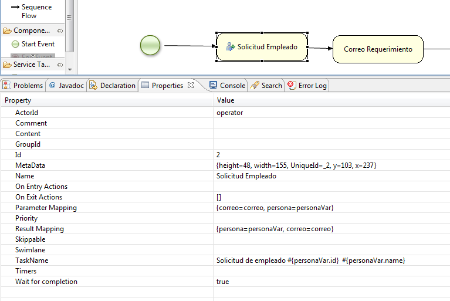 If you are not planning to modify "persona" in the User Task, then is should be enough to remove it from the Result Mapping attribute of "Solicitud Empleado". I think, that in your case, you need to pass variable 'm' to the completeTask() method. As far as I can see, you are declaring the Map, setting "persona" in it, but then you are not passing it (as the third parameter) to the completeTask() method. I don't trust in the editor. This problems are usually related with a typo or with some forgotten mapping. If you cannot solve it please share the bpmn/xml file that describe the process, so we can check the mappings. 16:15:36,927 ERROR [STDERR] at java.net.URLClassLoader$1.run(URLClassLoader. Do you have com.lincoln.jbpm.model.Persona in the application classpath? Are you using jbpm-gwt-console? Where are you getting this error? client application, jbpm runtime or human task server? 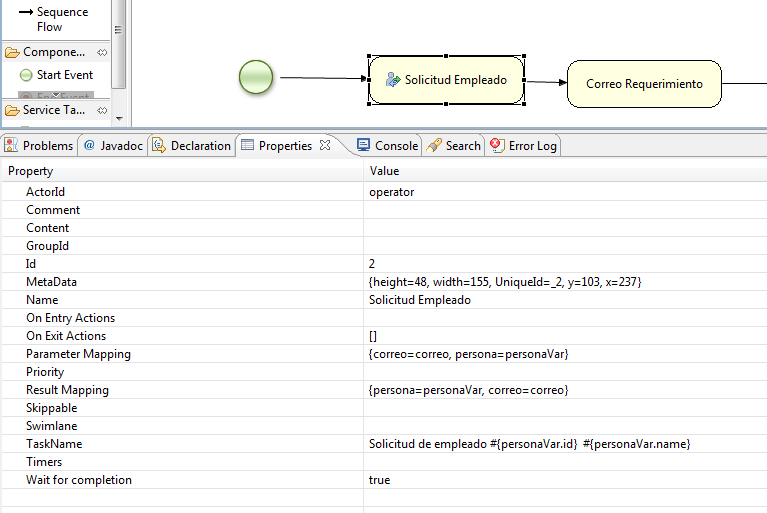 Persona is in the classpath, it is deployed a as WAR next to bpmn and drl files. I am using Human Task Server, and running the flow through web interface. I have fixed this problem, I have to generate a Jar file whith Persona class. When i complete human Task 2 trigger Email Task, but Service Task do not get finished, that is the reason why Human Task3 never start. It works fine, I would like to know why Email Task does not get ended. are you registering any workItemHandler for the Email Task? are you binding the "
To the tns:name attribute in your <task> ?? Are you getting those system.outs in your console or an stack trace? The work item should be completed and the process should continue with the information that you are sharing with us. Yes, I am mapping, none of the system.out is showing in console. The workitems handlers are mapped to "task types" and not task names. If you are using the custom Email node which comes with the pallete, you should register it with "Email". Otherwise, you will have to register with "tns:taskName" value which you can find it if you open the bpmn as xml.